Start a new Ford GT question. The GT is a special, limited-edition sport car from Ford which was originally produced in the 1960s, winning handily many of the Le Mans endurance races. Its signature body-length striping made it a cool find even in Matchbox collections. 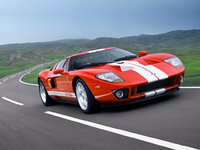 The latest version of the GT first appeared as a GT40 concept in 2002, in an attempt to expand Ford's branding beyond trucks and sedans into exotic supercars. 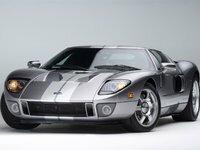 The first production car of the modern-day Ford GT appeared in 2004, and the last one rolled off in 2006. There are only about 4000 GTs on the road today, and many of these are in the hands of Ford employees or dealers. Designers found a perfect blend of classic GT styling with innovative technologies, lightweight aluminum body panels and chassis, and a road-worthy double-wishbone suspension and aerodynamic profile. More street racer than competitor, the new Ford GT still packs a lot of power in its V8 engine. At 550-hp, it makes 0-60 in 3.3 seconds. The mid-mounted engine is both visible and audible from the driver's seat. To accommodate modern drivers, the Ford GT is longer and slightly taller than the original, though it is still close to the ground with a low front overhang and 106-inch wheelbase for tight cornering and better stability. The interior is nicely decked out in leather and alloy trim and an instrument panel that hearkens back to the 1960s. The new GT is a rare bird, and its high price tag makes it inaccessible to the average street racing fan.